Faith in the improvability of the human condition is in short supply in the West these days. In China, however, it has been unbroken for nearly a century, even as the desirable end point of development has been repeatedly revised with the ascent and demise of Maoism. One of the most striking features that distinguish Chinese investors around the globe from their Western competitors — particularly those professionally involved in the development industry — is their faith in development. Why is this faith so abiding ? The title of Andrew Jones’ book piqued my interest in the expectation that it sets out to deconstruct the grand and ubiquitous Chinese narratives of development as “fairy tales.” In fact, however, the book’s subject is fairy tales in the literal sense. 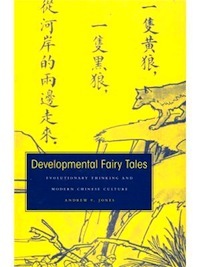 Jones is primarily interested in showing the relationship between the preoccupation with development — which he defines as “a way of knowing, narrating, and attempting to manage processes of radical historical change” (p. 3) — and the emergence of children’s literature in the Republic of China in the 1920s and ‘30s. The introduction variously identifies the scope of the study as a “historical enquiry into the development of this discourse [of development] in the Chinese literary and media culture of the late nineteenth and early twentieth centuries” (p. 3) and as “an unsystematic introduction to the cultural history of the child in modern China” (p. 5), but the book falls ultimately short of both promises. Jones argues that “developmental thinking has been crucial to the inception of modern Chinese literature” (p. 5). He focuses specifically on the popularity of social evolutionary theories, notably those of Herbert Spencer and Ernst Haeckel, whose enormous influence on 20th century Chinese intellectuals has previously been documented by historians such as Frank Dikotter (1992, 1998). The book’s first chapter explores what Jones calls a “novel of evolutionary adventure” written at the inception of Chinese vernacular literature: Wu Jianren’s New Story of the Stone (1905-08), a story inspired by Jules Verne Twenty Thousand Leagues under the Sea in which the hero of China’s most popular classical novel, Jia Baoyu, reappears in the future to witness a utopian Confucian society that has mastered the technologies of subjugating nature. The flying machines and gliding trains have all been designed “according to specifications suggested by ancient Chinese texts” (p. 57). From the second chapter on, Jones focuses on children’s literature, suggesting, plausibly, that such texts, created on the basis of European and Japanese models, are as emblematic as “critical realist” fiction of the development of modern Chinese literature. In Chapter 2, Jones documents writers’ and publishers’ use of animals both in reading primers and in new-style fairly tales as objects of evolutionary zoological taxonomies and protagonists of stories about competition and cooperation. Chapter 3 discusses the “discovery of the child” and the parallel between emerging ideas of developmental psychology — as manifested in particular in a collection of children’s drawings published in 1937 — and evolutionary theories of the human species. Chapter 4 examines the portrayal of educational toys — another new industry linked, as he documents, to publishing houses — in reading primers and in the 1933 film Playthings. The final chapter is devoted to the blind Russian anarchist, Vasilii Eroshenko, who wrote a series of children’s stories in exile first in Japan and then in China. China’s iconic modern writer, Lu Xun — a promoter of both Verne and Eroshenko — as well as his brothers the writer Zhou Zuoren, a pioneering advocate of the new children’s literature, and the zoologist Zhou Jianren, are central references throughout the chapters. Jones makes a number of arguments about the way early 20th century texts and films reflect both the embrace of evolutionary thinking and the occasional hesitations displayed by their authors. Yet the chapters do not really add up to more than an account of literary curiosities; they certainly do not offer a new view of the relationship between evolutionary thinking and modern Chinese culture. The writing, overladen with intertextual allusions, misses the opportunity to connect the stories told in the chapters to the broader picture of contemporary Chinese developmental, eugenic or pedagogical thought or practice. The faith in development that China now brings to poorer countries, the obsession with prenatal care, or the competitive examinations that begin with kindergarten entrance interviews at age three. Andrew F. Jones, Developmental Fairy Tales. Evolutionary Thinking and Modern Chinese Culture, Cambridge, Mass., and London: Harvard University Press, 2011. Frank Dikotter, The Discourse of Race in Modern China, Hong Kong, Hong Kong University Press, 1992. Frank Dikotter, Imperfect Conceptions: Medical Knowledge, Birth Defects, and Eugenics in China, New York, Columbia University Press, 1998.